Keep Pests Away With The Best Bug Zapper and Electric Bug Swatter. Flies, bees, mosquitoes, and moths are not welcome in my home. I don’t want my family to be bitten by insects. The mosquito-borne Zika virus keeps spreading and I want to protect my family from it as well as other diseases. I purchased a magnetic screen door a while back to keep bugs outside. Flying pests were still coming inside if someone kept the door open too long. I needed an efficient way to get rid of them inside the house. The solution to this problem is my new electric bug zapper and swatter. The zapper keeps our kitchen clear so my family can eat in the evenings unmolested. If a mosquito or fly enters my home, the electric swatter also helps me remove the threat quickly. When I want to enjoy the warm weather outdoors, I can use the swatter to keep pests from bothering me there, too. I’d like to tell you about the bug zapper and swatter we are using in our home. I’ll explain why I chose them as the best ones for my family. Then I’d also like to describe a couple of others I found that are also very good choices. Aspectek’s 20-watt Electronic Bug Zapper is powerful but also energy-efficient. It uses two ultraviolet bulbs to attract insects from up to 80 feet away. They die from a 2800-volt shock. The main upside to this kind of pest control is that I don’t have to spray chemicals around to keep bugs away. The Aspectek takes care of both flies and mosquitoes, which are our biggest problems. It even kills fruit flies, which is a big help in the kitchen. I hung the zapper on the wall with the chains included in the box. It’s out of the way but it still works very efficiently. Every few days I pull out the bottom tray and dispose of the dead insects. I don’t have to worry about anyone in the family getting a shock because the electrical grid is protected by a cage. The holes are too small for either little fingers or paws to explore. The Aspectek measures 15 inches long by 11 inches high and 3.2 inches thick. It is CE-certified for safety and RoHS compliant for the environment. Should I ever need to replace a bulb, they are the 10-watt black light variety that isn’t hard to find. My only wish is that I could use this zapper outdoors too, but it’s only made for indoor use. Instead, I take my new electric swatter outside with me. 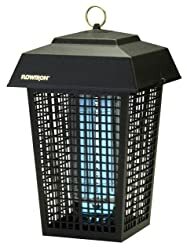 There is another electronic bug zapper light that I found while researching. It’s strictly for outdoor use. I’d like to tell you about it now. Since I needed a zapper more urgently inside my home than outside, I didn’t purchase the BK-40D from Flowtron. It uses a 40-watt bulb so it consumes more electricity than the Aspectek zapper I have in my house. If you’ll pardon the pun, the Flowtron was just overkilling for my needs right now. But if you have a large yard to protect, this could be ideal for you. Flowtron’s BK-40D Electronic Insect Killer is made to draw in flying insects from a whole acre outdoors. You can use a chemical strip (sold separately) to attract more insects like mosquitoes. It doesn’t discriminate between helpful insects and harmful ones. Any bug that is attracted to ultraviolet light will be fried. The BK-40D has a pretty design that makes it appear to be a lantern. Flowtron suggests placing it 25 feet away from human activity. This is partly for safety. Although the electrical killing grid is protected by a cage to keep pets and humans from being shocked, bug bodies can be ejected up to 7 feet from the zapper. One downside to the Flowtron is that there’s no removable tray to catch the dead bodies. Instead, most of them fall to the ground. This is not desirable for an indoor situation. On the other hand, the Flowtron is very powerful and would be ideal for a deck or patio or large yard. Just be sure you have a grounded extension cord if you place it far from an electrical outlet. While I chose an indoor bug zapper for my home, I purchased an electronic swatter as well. I’ll tell you about it below. When I first saw this rechargeable bug swatter I had to smile. It reminded me of a small tennis racket although it’s definitely not a toy. But while it’s safe for humans and pets, this swatter is deadly to bugs. Instead of only smashing an insect against a wall or the furniture, with this I can zap a bug in the air. It saves time, and it’s a lot less messy. There’s no bloody aftermath to wipe up. The three-layer netting does a good job of catching the insect while protecting the human using it from getting shocked. I did discover that it will continue to spark after contact with a bug if a piece of the body keeps it activated. A stray hair can cause the same effect. At the end of the day, the swatter’s handle pulls off and plugs into the wall outlet to recharge. The manufacturer added a special feature that I appreciate. There is a bright LED flashlight built into the handle. Now we’ve reached the other electric swatter I considered, but didn’t buy. I’d like to tell you about it, too. 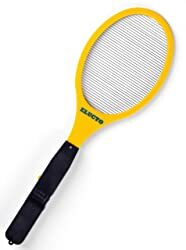 Elucto’s Electric Fly Swatter is also shaped like a racket, but it has only a single layer of deadly netting strung across it. There is no protection against shock, so once the swatter is turned on, it’s a really bad idea to touch the wires. It won’t kill a human, but it will hurt. Bugs that you swat will fry on contact. Fortunately, the green LED light bulb lights up when you press the button so you know when it’s on. Once you’ve taken care of the insect, you can turn off the swatter. The Elucto runs on two AA batteries and is not rechargeable like the swatter I bought. It comes with a 1-year warranty against defects. Not rechargeable so you need to have batteries on hand to keep it running. I live with my family, and that includes both old and young people as well as animals. I wanted to eliminate bugs in our home by using zappers and swatters that are only dangerous to insects and safe for humans and pets. I prefer to use energy-efficient appliances and tools. In order to feel comfortable letting the zapper run for hours, I wanted one that was as powerful as possible without raising the cost of my electric bill. Finally, the whole point is to eliminate unwanted pests. I chose a zapper and a swatter that were proven to be effective at killing insects. I would like to quickly go over the best features of these four bug zappers. I hope these reviews are helping you choose the best ones for your home, too. Aspectek’s 20-watt Electronic Bug Zapper is the zapper I chose for the interior of my home. It’s safe for humans and pets but deadly to flying bugs. It uses only 20 watts of energy and draws in insects from up to 80 feet away. Most of the dead bodies fall inside the removable tray, so it’s easy to clean and doesn’t make a big mess. 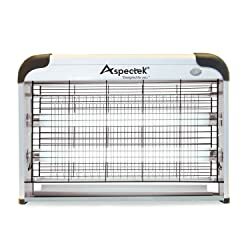 If you want an easy way to eliminate flying insects indoors, check out the Aspectek 20-watt zapper. It’s working great in my home. Flowtron’s BK-40D Electronic Insect Killer is made to cover up to an acre of yard outdoors. It uses 40 watts of electricity. Its exterior housing looks like a lantern and protects humans and animals against shocks. If you have a large yard and want an outdoor zapper, consider getting the Flowtron BK-40D. It can cover up to a whole acre of land. The Rechargeable Electric Bug Swatter with LED Flashlight is my go-to tool for catching stray flies and mosquitoes inside and outside the house. As its name indicates, it’s rechargeable in any wall outlet. The three-layer netting protects the user from shocks but lets insects enter for a deadly surprise. Elucto’s Electric Fly Swatter has a LED light to tell you when it’s ready to kill flying bugs. It runs off AA batteries so you can take it anywhere even if you don’t have electricity. When you need to chase down the errant fly and you don’t want to make a mess, try either one of the electronic swatters in this review. 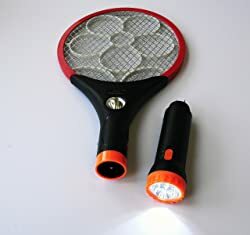 If you have children or pets, I would recommend the no-name brand swatter I purchased that comes with a LED flashlight. I’m grateful for our bug zapper and swatter. They help me and my family to feel comfortable in our house. I feel safer keeping the threat of Zika, other bug-borne diseases, and bites all at bay. I hope you find zappers that help protect your family, too.